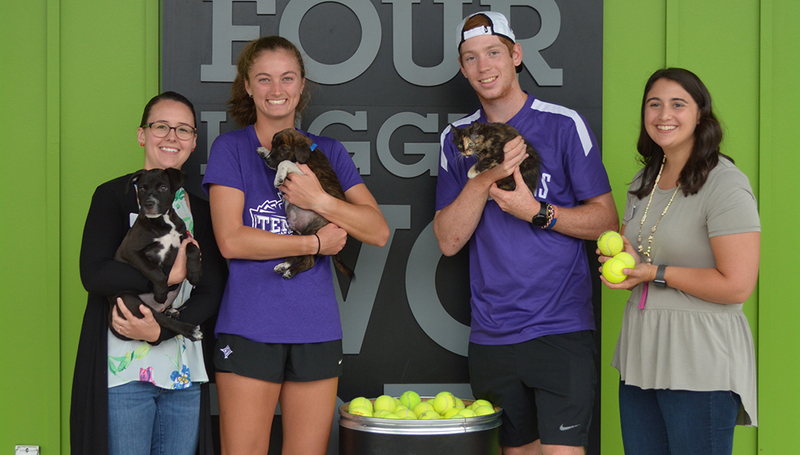 Furman tennis players Danni Vines ’20, center left, and Jake Munns '19 stand in front of a tennis balls donation bin with Erin Simmons, far left, and Samantha Baker of the Greenville Humane Society. 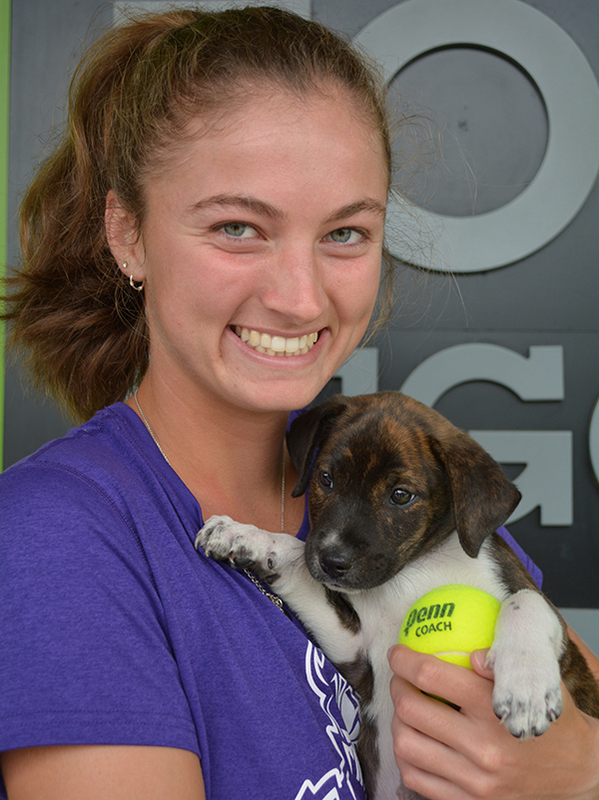 The pups at the Greenville Humane Society have some new toys to fetch thanks to Furman tennis player Danni Vines ’20. 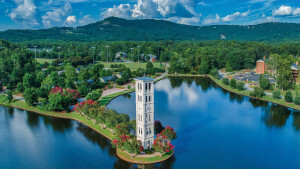 Last spring, Vines was a resident of the Furman Greenbelt Community and enrolled in the “Making Change Happen” class, under the instruction of Weston Dripps, associate professor of earth and environmental sciences and director of Furman’s Shi Center for Sustainability. 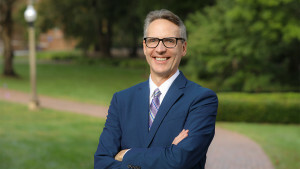 Students are challenged “to develop and implement action plans for addressing campus sustainability issues that they identify,” Dripps says. 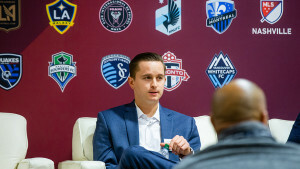 Vines, the Southern Conference Freshman of the Year in 2017, is one of the top players on the Paladin team, and she admits she’d never given much thought to environmental issues or what happened to the mountain of old tennis balls she and her teammates practiced with until she had to come up with a project for the course. 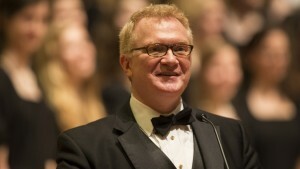 “I didn’t know a whole lot about sustainability going in, but I learned a lot from Professor Dripps and the class,” Vines says. “Danni recognized an opportunity in finding a reuse for the hundreds of tennis balls that the teams were going through each season,” says Dripps. With the help of her roommates, Vines started collecting the used balls that used to be thrown away. She collected them in a laundry basket until Dripps was able to secure funds from the Shi Center for the purchase of official ball-donation bins. Two outdoor weatherproof bins now hang courtside in addition to two painted and labeled bins explaining the initiative located at the base of the stairwells on each side at the court level. Danni Vines and one of the adoptable puppies at the Greenville Humane Society. The used tennis balls were initially donated to one-time causes, but the project found its perfect match in partnering with the Greenville Humane Society. “It was a more permanent solution to bring tennis balls once a semester to the dogs and for owners to take (them) whenever they get a new dog,” Vines says. “The group from Furman came by on Monday, Sept. 24, to drop off the tennis balls in our adoption center. We are very grateful for this donation and partnership,” says Erin Simmons, donor relations coordinator for the Greenville Humane Society. Vines’ initiative has even inspired the men’s and women’s tennis teams to work with the Humane Society to organize a future service project. When the Furman teams practice and see used tennis balls go into those bins, the players know they are doing their small part to reduce and reuse. The dogs at the Greenville Humane Society seem to be enjoying the partnership as well. Vines has some advice for anyone else looking for a sustainability opportunity. “Be conscious of what you’re using and how it’s affecting the environment,” she says. The Greenville Humane Society is the second largest no-kill facility in the Southeast, and 6,158 animals in its care have been adopted. To adopt, visit this link to get started. Last updated October 25, 2018 .